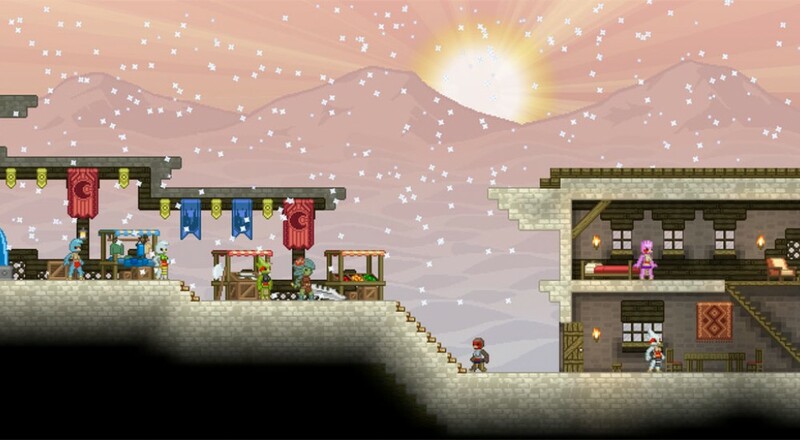 Co-Optimus - News - Starbound Combat Update Overhauls Battle System... Again! Secondary weapon attacks, plus a giant mole, I think. Starbound continues rolling through the updates, preparing for the inevitable day the developer proclaims it "ready". The latest release overhauls the combat system once again, taking one small step away from the smack and run style and one giant leap towards interesting and varied fights across the galaxy. First on the combat agenda: new weapons! The standard array of melee and ranged weaponry has been expanded to include a wider variety of both types, including something I swear is a laser guitar. Weapons now have secondary abilities to give you more options in combat, such as creating a barrier against shots or spinning in a circle to hit enemies on all sides. All of this new shooty/slappy stuff needs something to shoot/slap, so the update brings in truckloads of new enemies to fight. Each biome has a couple of new baddies to encounter, and just as before, they're weird. Like, what is that guy about a minute into the video? Space mole? And finally, the combat update isn't just about combat. There's also two new biomes, hoverbikes to ride, generated colony quests, and more. Yes, it's time to go play Starbound again. Grab your friends, fire up the server, and start exploring!